If you’re a Huskies fan or if you just want to talk about the game or a specific draft prospect… here’s an open thread. The Seahawks have signed C.J. Spiller today, adding much needed depth to the RB position. With Thomas Rawls out and C.J. Prosise still recovering from a wrist injury, Spiller can act as a rotational back and a third down back. He was strangely cut by the Saints after week one despite not featuring against Oakland. New Orleans incurred a dead cap penalty because they kept him on the week one roster. We’re just recording this weeks podcast now and will touch on this, plus we have an early 2017 mock draft. There’s a lot of hype around quarterback DeShone Kizer at the moment. Every year there’s a fashionable ‘alternative’ #1 overall pick. It ends up becoming a consensus and then the overreactions follow when reality sets in. I’ve watched all four Notre Dame games now and feel comfortable judging him. In terms of physicality and talent he’s the complete package. Ideal size, nice release, plus mobility with the ability to both extend plays and make gains as a runner. You could make a highlight reel of 5-6 throws where Kizer looks every bit a possible #1 overall pick. The thing is, there’s also a lot of ugly in there too. And that shouldn’t be a surprise — he’s only featured in 17 games in college. In comparison, last years #1 pick Jared Goff started 37 games at Cal. Kizer looks like a raw starter who just needs time to figure everything out. For that reason, the ideal situation would be for him to return to Notre Dame next season and feel the benefit of extra time on the field before turning pro. That’s a tough decision to make if there’s a chance you’ll go in the top five of the draft. Andrew Luck made a decision to stay at Stanford and risked injury. Kizer faces a similar dilemma. In Saturday’s home loss against Duke, three plays pretty much sum up the hit-and-miss September 2016 version of DeShone Kizer. With 52 seconds left in the first half and ideally placed to lead at least a field goal drive before half time — he launched a pass so out of reach for the intended target even the defensive back climbing onto the shoulders of the WR couldn’t make the catch. On the next throw on a 3rd and 14 crossing route, he threw marginally behind the target on an easy completion and let the DB get a hand on the ball to break it up. Yet on his first throw to begin the second half, he fit a perfect pass into the smallest window for a big gain — throwing over a linebacker and in front of the DB. It was perfection (the WR caught it and fumbled, summing up Notre Dame’s day). His touchdown pass was equally beautiful — a perfect fade to the left corner of the end zone with ideal touch, velocity and placement. Yet after that he came right back with another shocker — a hopelessly under-thrown ball to the left sideline that was easily cut off by the DB (who dropped the chance at a possible pick-six). It was a real cringe moment — just like his bizarre decision that ultimately cost Notre Dame the game. With about a minute to go on 3rd and 20, Kizer had to take the snap into his own end zone. He had good protection but sensing he needed to get rid of the football to avoid a safety — he lobbed a hail mary pass into coverage and was intercepted at about the 40 yard line. The TV cameras picked up a bemused looking Brian Kelly mouthing ‘What are you doing?’ at his QB with disbelief written all over his face. Duke drove into field goal range and won. Kizer also fumbled a snap during the game. These are all pretty basic errors that scream a lack of experience. A team can try to iron out these kinks in the pro’s and due to his high upside and potential that might be what happens next year. Let him sit ala Jared Goff and Paxton Lynch. A case can also be made that he’s better learning lessons on the field in a competitive environment. Kizer is really, really good — and as long as he stays healthy he’s assured of a place at the top of a draft be it in 2017 or 2018. For the long term benefits of his career — he looks like a guy who just needs more experience. And the remaining schedule in 2016 with Notre Dame slumping to 1-3 might not be enough. On a separate note — Mike McGlinchey looked really good in this game. Great balance, never flustered, kept everything in front of him in pass-pro and showed some power in the run game. His athletic testing at the combine will be fascinating. Both Kizer and McGlinchey come across really well during press interviews and teams will love their character. Tight end Evan Engram is such a weapon and might be one of the more underrated draft prospects this year. He had a big day against Georgia with six catches for 95 yards. His best moment? An incredible endzone leap to high point the football over a defender for a touchdown. His vertical leap looks like it’ll be incredible at the combine. Ole Miss frequently line him up in the slot and Engram has receiver athleticism and creates constant mismatches vs slot corners and linebackers. You can imagine him working in the Patriots offense as a slot receiver or in a 2TE set alongside Gronk. He could easily work his way into the latter part of the first round or the top of the second. One final note — Pete Carroll keeps talking about suddenness at running back. He mentioned it again today on ESPN 710 when discussing Christine Michael. If that’s the most important aspect for a Seattle RB going forward — the most ‘sudden’ back in the 2017 class could be Christian McCaffrey. He’s not a physical powerhouse, wearing down a defense. In terms of burst and ability to get upfield quickly — he’s extremely good. That was my big takeaway from the UCLA game on Saturday. It’s something to monitor — especially if RB becomes a key need in the off-season. After a week of overreactions to the Rams loss, this was a refreshing reality check. The Seahawks are still a really good football team. Their offense is still really good. They are capable of blowing out a bad opponent. On a day when the Pittsburgh Steelers were destroyed by the Eagles and the Cardinals were pasted by the Bills — this was a day to remember the NFL is tough. And when you have an off day it can get ugly. Seattle’s off-day, with most of the offense hurting especially at quarterback, was a 9-3 road defeat to a divisional nemesis. That same opponent, the Rams, lost 28-0 to this 49ers outfit. That was their off day. Let that sink in. When’s the last time the Seahawks were blown out? Week 2 in 2011? The win came at a price. Russell Wilson suffered another ugly injury that left him reaching in pain for his left knee. It had the look of a MCL sprain but could’ve been much worse — a broken leg or an ACL. It was a relief to see him remain on the sideline and actually board an exercise bike towards the end of the fourth quarter. The week five bye can’t come soon enough. The game also couldn’t end soon enough in that final quarter. Trevone Boykin led a nice scoring drive before giving up a horrendous interception. The defense in ‘relax’ mode gave up 15 cheap garbage time points. — The run blocking was much improved today. On the first score Sowell, Britt and Glowinski nailed their blocks and Tanner McEvoy also helped. Christine Michael looked like he did in pre-season and they need this version with Thomas Rawls still banged up. — Jimmy Graham was back to his very best less than a year after suffering the worst possible injury. He had six catches for 100 yards and a touchdown — including a highlight reel takeaway on a jump ball vs Eric Reid. At this level Graham is virtually unstoppable and will be a huge weapon for the offense. — Doug Baldwin is somehow still vastly underrated. His current level of play should put him among the NFL’s top receivers. His quickness, route-running, ability to get open, reliability and production make that new contract look like an absolute bargain. Today he had eight catches for 164 yards and a touchdown. — No, Darrell Bevell and Tom Cable should not be fired. — Aside from some sloppiness at the end, the defense completely shut down the Niners. Coverage was excellent throughout. The pass rush was limited today but it didn’t need to be great. Three weeks in the Seahawks are #1 in yards allowed. The Niners completed 4/15 on third downs. The most important thing right now is getting Wilson healthy. Everything else is firing. Graham and Baldwin are playing at a high level, the defense is on it, the running game is starting to get there. They need their quarterback healthy. I’ve got a few thoughts on the weekend’s college football coming tomorrow. If you’re watching a game or a draft prospect today — tell us about it. Here’s today’s open thread. — This was Derek Barnett’s best performance of the season so far. He basically took over the game in the second half as momentum swung completely to the Vols. On a third down play he beat left tackle David Sharpe off the edge for a sack. During the next drive he crashed the LT inside for a loss of yards on a run play on second down. He finished the drive with a brilliant sack from the wide-9 position — showing incredible lean and balance for his size to again beat Sharpe. I’ve not been one to argue Barnett was destined for round one in the past and he can blow a bit hot and cold. This was a terrific showing though. — Until Barnett’s masterclass, Florida’s Caleb Brantley was the most impressive defensive player on the field. On several occasions he exploded off the snap and won with a combination of speed and technique. He was constantly in the backfield until the momentum shift. He also forced a turnover, hitting Joshua Dobbs’ arm allowing Jalen Tabor to grab a pick. — Tabor had that interception and it was an instinctive play. He left the game injured for a period before returning and almost immediately getting beat on a downfield pass for a long TD score. It looked like he slipped on the play. — Alex Anzalone and Jarrad Davis spent most of the game in coverage which was a bit of a surprise. When Anzalone did rush/blitz he looked sharp and the coverage work was good too. Davis got beat by the TE on a key touchdown. — It was a shame not to be able to watch cornerback Cam Sutton in this game. He’s out with a bad ankle injury. Providing he makes a full recovery he could easily be a very high pick next year. I want to offer a counter to those thoughts today. 32% of Carroll’s/Schneider’s picks in the first three rounds have been spent on the offensive line. That’s double the amount of defensive linemen and receivers — ranked second on the list. It has been argued that the Seahawks have either misused these picks (bad evaluations) or have chosen not to re-sign the players they drafted to save money (priorities). For example, the Dallas Cowboys are praised for drafting Tyron Smith, Travis Frederick and Zack Martin with back-to-back-to-back first round picks. The Seahawks, when they have sought to address these positions, have not been in position to draft players of similar quality. Had they lost to St. Louis in week 17 of the 2010 regular season, the Seahawks wouldn’t have made the playoffs (no Beastquake) and would’ve picked #8 overall in the 2011 draft. There is every chance they would’ve used that pick to draft Tyron Smith, who was taken by Dallas at #9. Instead the Seahawks picked at #25. By that point Smith, Mike Pouncey, Nate Solder, Anthony Castonzo and Danny Watkins had all been drafted. Determined to address a need on the O-line, the Seahawks selected James Carpenter. Aside from a couple of injury hit seasons, the Seahawks got a good few years out of Carpenter. That’s more than can be said for Watkins who was taken at #23 (barely played and became a firefighter) and the next two offensive linemen drafted after Carpenter (two enormous busts, Gabe Carimi and Derek Sherrod). When Carpenter left the Seahawks he signed a four year, $19m contract with the Jets worth nearly $5m a year. Carpenter was decent for the Seahawks — but would you really want to keep him at $5m a year? That wasn’t the Seahawks being cheap — either in terms of draft investment or ponying up the free agent cash. They prioritised the O-line with the high draft pick. They took the best remaining option on the board. They got a few years out of him and then the player signed a big deal somewhere else. Had they been able to draft Pouncey or Solder or Smith — it probably would’ve been a different discussion. They might’ve been worth $7-12m a year or whatever it would’ve taken to get the deal done. Is Carpenter worth $5m a year to this Seahawks team? At a time when they’ve had to pay Russell Wilson, Richard Sherman, Earl Thomas and a host of others top-tier money? Now onto Okung. This was Seattle’s first draft pick by Carroll/Schneider. They immediately made a left tackle their priority and used the #6 overall pick to get one. Under the old CBA, they also gave Okung a contract worth $48m with $29m in guarantees. That’s 24 missed games during his six-year rookie contract. 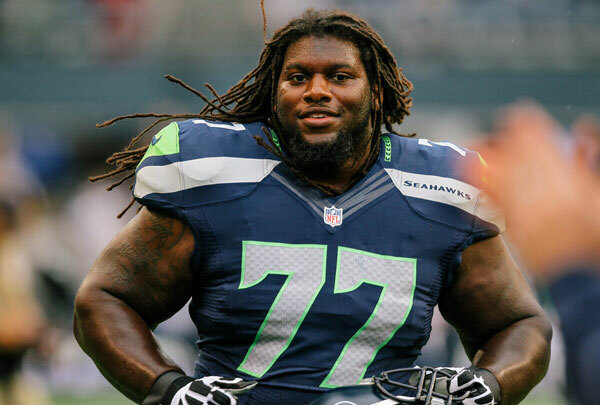 When he missed those eight games in 2013 (the Super Bowl season) the Seahawks were forced to start Paul McQuistan at left tackle for half of the regular season. Okung was good when he played — but not great. He never achieved the level of Trent Williams (taken two picks earlier in the 2010 draft) and was more serviceable than dominant. Right now a lot of fans (and probably some of the staff) would settle for that over the current starting left tackle. Yet a front office has to consider many different factors when considering a contract extension. Okung, without question, was an injury liability. If you offer him the big bucks and he continues to miss four, six or eight games a year — do you regret it? If he was still on Seattle’s roster now albeit injured, would people be criticising the front office for re-signing him? Then there’s the angle of his decision not to use an agent. The deal he signed in Denver was widely mocked for being the ultimate team friendly contract. Was such a contract ever a possibility in Seattle? Or did Okung need to move on in the face of growing criticism for not using an experienced negotiator? We’ll never know the exact details — but this was clearly a complex situation. Not exclusively a cost saving measure. The Seahawks got a good few years from both Okung and Carpenter. Neither was a terrible pick or a bad evaluation. Both moved on. The success or failure of a first round pick should not be focused exclusively on whether they get a second contract. Was the Bruce Irvin pick a failure? Arguably all three players played their part — but ultimately others (UDFA WR’s, 5th round cornerbacks, third round QB’s, free agent DE’s) contributed more. They also let Breno Giacomini (signed for the Jets for $4.5m a year) and J.R. Sweezy (signed with the Buccs for $6.5m a year) walk. Again, would you really want to keep those two players at that price? Sweezy’s average annual salary in Tampa Bay is only $650,000 less than Michael Bennett’s and Cliff Avril’s (they both earn an average of $7.125m a year in Seattle). As a consequence the investment in the O-line has continued via the draft. In a weak year (2014) for explosive offensive linemen, they spent a second round pick on the best player remaining that fit their criteria (explained in detail here). It’s taken Justin Britt a while to work it out — but he looks at home at center. This year they spent another first round pick on the O-line drafting the hulking, explosive, enormous athlete Germain Ifedi. In pre-season he looked terrific and the hope is he’ll get healthy and become a major asset for the offense. They also spent a third rounder on Rees Odhiambo. He’s yet to feature — but once again they’re making the investment. Many have questioned the decision to trade Max Unger for Jimmy Graham and his $9m a year salary. Graham had a rough start to his Seahawks career with minimal production and a serious knee injury. Unger played 16 games and earned a new contract with the Saints. Was it a mistake? Maybe. But again context is required. Unger missed thirteen games in 2013/2014 for the Seahawks. Perhaps the less aggressive, pass-friendly offense suits him physically in New Orleans? And while it hasn’t worked out for Graham in Seattle so far — he remains one of the most unique players in the league and could still become a major asset. Unger’s new deal is worth $7.4m a year on average. That’s more money than Avril and Bennett. While it’s true the Seahawks spend less on their O-line than anyone else ($8.597m this year) — can you justify a $7.4m cap hit for a center in his 31st year who missed 13 games in his last two seasons for you? Since moving Unger there really hasn’t been an opportunity to draft a center of the quality of, for example, Travis Frederick. In the 2015 draft, Mitch Morse (#49) and Ali Marpet (#61) were both taken before Seattle’s pick at #63. If the Seahawks had any interest in Ryan Kelly this year, he was long gone by their pick at #26. It’s possible they fully intended to draft a young center but it just wasn’t possible. Again, that’s just the way the draft works sometimes. You can’t fight the board. Consequently the Seahawks appear to have found a viable solution (possibly for the long term) in Britt. Not helping the situation has been Seattle’s draft position. They owned pick #6 and #14 in 2010 and #12 in 2012. Aside from that they’ve consistently had picks in the late first round (and picks at the end of each subsequent round). They simply haven’t been in position to draft a Pouncey or a Martin in the middle of the first round. With a growing demand for athletic, talented O-liners — not many are lasting into the late first. Ifedi is/was a rarity. There’s a chance the league will regret letting him last that long. Players with his length, athleticism, aggression and size don’t come around very often. Quite a few teams will regret allowing Kelechi Osemele to last into round two — Ifedi has a similar physical skill set. Aside from Ifedi, you could argue Seattle’s success has ultimately prevented them getting at the top O-liners since 2012. What can they really do about that? Here’s what it comes down to: They’ve used a lot of high draft picks on the O-line but the players available and their overall value to the team haven’t matched the contracts they’ve received from other clubs when becoming free agents. That’s not being cheap. That’s not deliberately being thrifty on the O-line. That’s not ignoring the position. Had they been able to draft a Tyron Smith or Zack Martin they probably would’ve done — and they probably would’ve extended their contracts. You can only draft the players available. You can’t magic up elite linemen. You can’t magic up top-16 picks either. If they get a great O-liner they’ll probably reward them as they’ve done with the Baldwin’s, Avril’s and Bennett’s etc. Most of their decisions have been forced. Players getting good deals elsewhere, players being injured, other players at other positions playing really well and eating up cap space. I don’t think they’re trying to manage this situation because they’ve decided to spend less on the O-line — I think they’re managing this situation because they have to. These are the cards they’ve been dealt. How important is a star RB to the Seahawks offense? So far the Seahawks running game has mostly stalled — but there are a number of reasons for that. Injuries, Russell Wilson’s current immobility, poor blocking. Will the Seahawks offense ever function as effectively without that fear factor in the run game? Can Thomas Rawls prove this evaluator wrong and become the man? Do the Seahawks need to be looking for a Marshawn Lynch replacement or can they progress with a committee? To make any definitive statements on the performance of the offense so far would be a big mistake. It’d certainly be premature. After all — the Seahawks didn’t look particularly explosive in weeks 1 & 2 in 2013 when they were completely healthy. They scored 12 points vs Carolina and had just five vs San Francisco in week two before a late tear thanks mainly to Colin Kaepernick turnovers. Last year is another example. The offense was an abject mess behind a faltering O-line before ending the year on a record setting pace. Running the ball well is especially important right now, however, with Wilson suffering the first really serious injury of his pro career (at least one that seriously impacts his ability to function). The blocking of the O-line will be judged to the Nth degree. The running backs will also, eventually, come under the microscope. This will be a good test of where the Seahawks are at with their running game. Overall there aren’t many elite backs in the NFL these days and teams have moved so far away from the run in some cases it’s become an afterthought. The feeling is you can find production late in the draft and it’s almost cool to be passive about the position. And despite all of that — there’s nothing quite like watching an elite runner in full flow. It’s one of the true glorious sights in sport. Seahawks fans know that better than anyone and we’ll likely find out how badly Seattle needs a ‘great’ in the next few weeks. The Seahawks ranked Todd Gurley as the #1 prospect in the 2015 draft per ESPN reports. It’d have to be a special player to take a RB in round one and I don’t think they’d sell the family silver to get at a running back — but I’ve still felt obliged to focus on the position in college football this year, just in case. It’s a deep class with only one guy who gets you out of your seat — LSU’s Leonard Fournette. He is a complete player and should be considered a possibility for the #1 overall pick. He will almost certainly go in the top five. The rest of the class have so far been largely underwhelming. Dalvin Cook is a home-run hitter but needs open space to be at his best. He has looked average in 2016 so far. Christian McCaffrey is an exciting dual threat runner/receiver but is probably better suited for the offenses in New Orleans, Detroit or San Diego. Samaje Perine just hasn’t got going at Oklahoma while team mate Joe Mixon has incredible potential but also major character flags that need to be investigated. Royce Freeman is fast for his size but doesn’t play with any real intensity. He’s a big finesse back. If a team is willing to spend the house on Jared Goff — I don’t see why teams won’t similarly covet Fournette. Good teams should consider it. Would the Seahawks? Like I said, I think it’s highly doubtful. But he looks like a special talent. Can Rees Odhiambo offer a solution at left tackle from 2017? The Dallas Cowboys didn’t develop the so-called best O-line in the NFL overnight. It took three first round picks spread over three years to put their band together. In tonight’s Monday Night Football, Chicago quarterback Jay Cutler was under constant duress and left the game with a hand injury after a sack/fumble. His line consisted of highly rated Josh Sitton, second rounder Cody Whitehair and first round pick Kyle Long. So in other words, the Seahawks aren’t alone when it comes to O-line issues and perceived quality additions aren’t the only answer. The four offensive tackles starting in Super Bowl 50 were Michael Oher, Mike Remmers, Ryan Harris and Michael Schofield. Neither Denver nor Carolina fielded a vaunted O-line. The Seahawks are essentially going through a reboot this year. Moving on from Russell Okung and J.R. Sweezy, plus the predictable switch again at center, meant three positions were changing at least. For all we know the Seahawks are planning to ‘do a Dallas’ and focus a lot of upcoming draft stock on the O-line (they have precedent here, more on that in a moment). Yet like Dallas, it might take 2-3 years to achieve a respectable group. People will cringe about that — but it is what it is. Every team in the NFL is having to deal with the fact they don’t have a flawless roster. Two of their early picks this year were spent on the line (Germain Ifedi, Rees Odhiambo) while a third was spent on a blocking TE. There’s not really much more they could’ve done in the 2016 draft. Ifedi, before his injury, looked like a lynchpin for years to come. Odhiambo is admittedly taking longer to get up to speed. He did suffer with injury issues in college and that possibly hampered him during his first training camp and OTA’s. The plan for Odhiambo appears to be eventually to let him compete at left tackle and left guard. While not available to start immediately in 2016 — his selection could prove to be crucial for the long haul if he becomes even a league average starter. Especially given the decidedly weak OT options set for the 2017 draft. If Odhiambo and Ifedi nail down the LT and RG positions (and yes, it’s a big ‘if’ for now) then really the only question mark is right tackle. I think most people would accept Mark Glowinski deserves long term consideration at left guard — while Justin Britt is comfortable and performing well at center. With George Fant also going through a redshirt year — he too could also provide some competition next season. All of a sudden the future doesn’t look too bleak. There’s nothing to suggest this won’t be a position they continue to focus on. This front office has already spent as many first round picks on their O-line as Dallas between 2010-2016. They haven’t dodged this position group. The issue they’ll have is the seemingly desperate lack of good left tackles in college right now — and that could increase the pressure on Odhiambo and Fant to potentially provide a solution from 2017. Alabama’s Cam Robinson looks the part and is clearly very athletic. Yet his body control leaves a lot to be desired, his balance and set can be an issue and he gets into awkward positions. He has the potential to be a league leading left tackle but technique wise he’s a long way off. On Saturday he was doing a good job blocking 225lbs Marquis Haynes — but on two occasions Haynes actually threw him to the turf at the end of the block. How? Robinson has nearly a 100lbs weight advantage. Who knows who’ll emerge between now and the Spring — but right now this isn’t looking like a great LT draft class. In the short term the key is getting Ifedi healthy and just finding a rhythm. The pass protection has been better than reported. It’s the run game where they’re having issues. With Ifedi lining up next to Britt and Glowinski — they’ll have a better chance to work the interior. That’s an explosive trio. The two tackles need to provide similar punch on the outside — while Vannett’s imminent return should also help. The Seahawks have a problem at the moment and it’s called ‘offense’. In eight quarters they’ve managed one desperation touchdown drive to avoid a second consecutive 0-2 start. While the defense is playing brilliantly (19 points conceded in two games) the offense can’t even muster up an average supporting act. Injuries are an obvious issue. Russell Wilson put in a reasonable performance considering he’s nursing a sprained ankle. Yet it’s clearly impacting his ability to move around, make plays with his legs and extend plays/drives. Thomas Rawls, Doug Baldwin and Tyler Lockett left the game at various points due to injury. 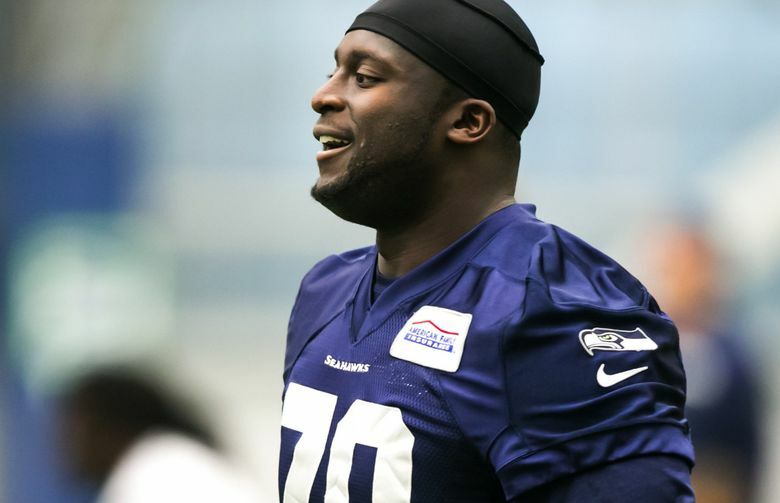 Germain Ifedi remains out and his replacement J’Marcus Webb was questionable but played. C.J. Prosise missed the game with a wrist injury and Nick Vannett is still out. Jimmy Graham is also still feeling his way back into football after recovering surprisingly quickly from a serious knee injury. None of this is helping an offense which is capable of brilliance when there’s a rhythm (weeks 11-17, 2015). Unfortunately when things aren’t working — this is the result. When other teams have an off day they usually end up on the wrong end of a hammering. It’s to Seattle’s credit that this ugly 9-3 battle is about as bad as they can possibly play and yet they were driving with an opportunity to win at the end. They need to get healthier and find some production if they want to avoid 2-2 or worse with the battling 49ers and the impressive Jets ahead of a week five bye. The surprising thing is the running game. In back-to-back weeks it’s never really been established. Christine Michael went 10-60 and Thomas Rawls, before the injury, had -7 yards on seven carries. It’s putting a lot of strain on Wilson to be the offense at the one time in his career when he’s most in need of help. The Seahawks are struggling to set the tone and are being forced into situations (3rd and long) that are not kind for an injured quarterback. There were also a lot of basic errors in this game. The Cassius Marsh facemask at the end took time off the board and almost ended the contest just when the Seahawks were about to get the ball back. There were a lot of ticky-tacky penalties too but also some costly, avoidable ones. Christine Michael’s fumble was the finishing touch to a disjointed performance. People will talk about the O-line performance. This was never going to be a kind match-up against an elite front four — even if they had a top-10 pick playing instead of Bradley Sowell. More concerning than the pass-pro is the teams inability to consistently run the ball. Seattle ended 4/13 on third downs and actually had more net yards than the Rams (306 vs 283). Yet L.A. managed to find the chunk plays to get into scoring position. There were some positives. Jimmy Graham looked sharp and will be needed as an outlet for Wilson until he’s healthy. Tyler Lockett looked explosive and almost led the comeback with the 53-yard grab downfield late on. Frank Clark had two more sacks, Marsh should’ve had one but for the penalty and Michael Bennett had one too. For some reason this pressure isn’t leading to even a sniff of a turnover. It’s puzzling why, in two games against bad offenses, the Seahawks have barely looked like taking the ball away. The key next week has to be to establish some offense in particular the running game. For years the Seahawks could lean on Marshawn Lynch and the run to set the tone. They have to ensure that’s still the case with Wilson injured.